Recently our company has obtained a digital camera for microscopes – Altami SCMOS05000KPA. The main criterion for choosing this camera was the availability of adapters for old Soviet microscopes and a high resolution matrix. The camera has a matrix of 5Mp, which allows you to shoot the highest quality images of our products. We planned to use this camera to present the quality of our products, as well as for remote online demonstrations and various kinds of conferences. SCMOS05000KPA Altami camera saves a lot of working time for our employees and allows you to quickly and accurately determine the result of work, and also helps to demonstrate our products for our clients. First we used Altami VideoKit program, which came with the delivery. It allows you to take pictures and make video from a microscope, as well as adjust the camera. But we concluded that our company needs a measurement functionality, which is not available in the Altami VideoKit software, for stricter product quality control. After a short search on the Internet, we found more advanced software from the company “Altami” – Altami Studio. After getting acquainted with the software functionality, we came to the conclusion that this product is suitable for the tasks that we have set. It was easy to get acquainted with the functionality of the program. The interface is simple. The software also allowed: adjust the camera, its resolution, color correction, shoot photos, make video, etc. But the most important is that the program allows you to measure the size of products using a variety of tools. The toolkit is easily calibrated with a special calibration plate, so calibration is not difficult. Sometimes we had questions about the use of some of the program tools, but they can easily be found in the user-friendly instruction manual available on the official website of the manufacturer, on the CD with the software and in the program itself by clicking F1 button. In this manual you can find answers to almost all the questions that face in the process of using Altami Studio, and on specific and atypical questions and difficulties, consultants from Altami answer them very competently and promptly. Our company is specialized in processing of glass microballoons and a glass microsphere. The difference between them is in their size. This software has made it possible to easily improve the quality of screening, product processing and control over ongoing processes on the production line. Example of a product with large microsphere and with a few small conglomerates. 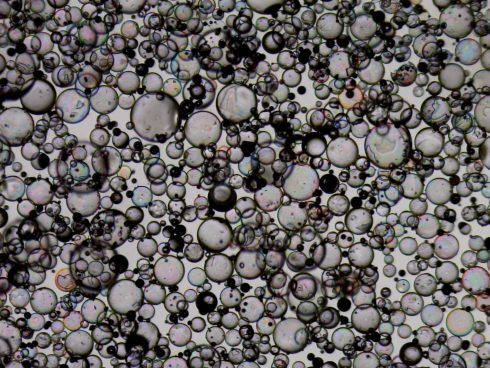 The product quality is satisfactory without fragments, but with a large microsphere and with a few small conglomerates. SCMOS05000KPA Altami digital camera is a premium product. It is easily connected via USB to a computer, very compact and high-quality. It has a wide range of applications in different types of microscopes because of the adapters supplied in the kit. Altami Studio software is quick to learn and easy to use. The program is accompanied by a very informative instruction, and the technical specialists of Altami very quickly and in detail answer even the most difficult questions. Altami Studio software is suitable for qualitative measurements of any microsphere. Altami VideoKit software is also user-friendly and simple software for basic applications, if no measurements are required. We express our gratitude to Altami for their excellent products and high-quality technical support!